Here at The Dirt Is Good To Me, I have shared my joy of metal detecting and occasionally, tried to make myself useful by talking about the very few things I have learned (I am not very smart). In the context of metal detecting, failing means digging a LOT of trash. Mountains of it. Fail and pay attention. That’s it. Basic. Brutal. I just learned that Babe Ruth held both the Home Run record and the STRIKEOUT record. He didn’t just miss the ball a lot; he missed the ball more than any other baseball player in history!!! How do you like them apples? So go out there and (responsibly) dig a lot of holes. Pay attention and dig the trash and then try again. I guarantee that your gold, silver, and relic finds will go through the roof. I was out at the park during my lunch hour trying all the new settings on my XP Deus metal detector, now that I have the new software version installed. Tweaking this and that I walked over ground that I have hunted to death and pulled many and sundry pieces of metal from said ground. One maddening thought kept crossing my mind and that was silent masking. Silent masking is when your detector fails to see any of the targets under the ground and simply runs silent as you run the coil over them. There is a technical explanation as to why this happens but I won’t cover that here. I simply want to bring it to your attention. It is crazy stuff though. I will leave you with this scenario: At my deep silver park, a municipal swimming pool opened in the 1920’s. Each summer until it closed (for a decade or so), the swimming pool saw upwards of 15,000 people (data from counts reported in the local newspaper every summer). If only 1000 of those people dropped a silver dime that’s 10,000 silver dimes dropped at that park during that decade. Too high of an estimate you think? If 500 people dropped a dime each summer that’s still 5000 dimes dropped in a decade. I’ve only found about 60 silver dimes at that park since I began hunting it last year. And by the way, I am not counting any of the people who went to the park for reasons other than swimming at the pool. So, I tell people that there are thousands of silver coins at this park waiting to be excavated. 99% of them, silently masked. What do you consider trash when metal detecting? Pull tabs? Foil? Zinc Lincoln cents? The reason why I want to split hairs here is that I have read many, many posts out on the Web, whereas some wizened detectorist tells noobies that if the VDI jumps all over the place and the audio is a mix of mid tones, high tones, and iron grunts, that the target is likely to be trash. Not too long ago, I would have accepted that assertion as gospel but now that I have put away childish things, I am looking at that kind of signal in a different way. Let me repeat something someone smarter than me said: “There is no such thing as an iffy signal, only iffy analysis”. So when you run into a signal as the one described above, you could be leaving a keeper in the ground if you don’t spend some time looking at it with a critical eye. Just yesterday, I ran into one such signal. What got my attention was the fact that the depth kept changing with each VDI shown in the screen. The audio changed accordingly. I asked myself, “Am I looking at an amorphous piece of aluminum can, or am I looking at several targets in close proximity here?” I walked around the target and tightened my swing to try to separate each sound. Eventually I could isolate the high tone and it came in somewhere below where a copper penny would be at 12KHz. If I moved the coil just a tad bit more, the mid tones and iron grunts would pipe in, at different depths. It was then time to dig it to see if I was right. I was right. In the hole, there were: One piece of aluminum can (can slaw), a piece of rusted iron, and a 1996 clad dime. Sure, it was just a clad dime but it could have been anything in the coin range, even silver. The VDI was a bit off because of the other objects near the dime. I am not suggesting you dig every signal of this nature. I am only suggesting that you spend a little more time evaluating them. It may pay off for you to do so. 1) Empty holes, or holes to nowhere as I like to call them. Unfortunately, given the way I run my detector and the nature of the signals I hunt, I dig more holes to nowhere than I should. And foil, well, foil may eventually grow on me and move over to the category of relic as well. I dig a lot of holes. I dig a lot of holes and I am always surprised when I run into the mystery of target masking. If things were really fair, every masked target would be a silver coin, or a gold ring. But alas! trash often masks other trash. Still, I have found a few masked silver coins in my time and I wonder just how many more masked silver coins I am leaving in the ground. Masking happens when a piece of metal is above a second piece of metal and your coil sees the target above but not the one below. If the the two pieces of metal are touching, masking does not happen, but rather your detector makes some kind of sense of the two pieces by seeing them as one object. Keep that in mind. Many people who do not know better out there, keep claiming that their detector sees through iron. That is not so. NO DETECTOR SEES THROUGH IRON. Not yet anyway. I have noticed through digging many holes and examining the items found therein, that the ratio of beaver tail pull tabs to square stay-tabs is like a bazillion to one. Even given the tendency people have to go through the trouble of removing the square stay-tabs from the can, there are not that many square stay-tabs in the ground, relatively speaking. That means that most of the pull tabs masking other targets are of the beaver tail variety. And they are not making them anymore! (ok, I have seen some modern products with beaver tail tabs, but very few). Sooooooo…when you dig a beaver tail pull tab and remove it from the park, it will not be replaced by another. Thus we begin to take the masking tiger by the tail. And here is the thing: if you find a site heavily infested with pull tabs and bottle caps, it only means that site saw heavy human activity in the past (or even sees heavy human activity presently) and that really is what we are looking for isn’t it? I mean rabbits and squirrels don’t drop silver coins or gold rings, people do. So go forth and mine those tab and cap wonderlands out there. There is treasure to be had! I am asked now and again to share my secret technique or my secret settings, or my secret spots by aspiring metal detecting fans. When this happens I can’t help but chuckle because I think of myself as a green, inexperienced beginner with no secret techniques under my belt. I discover something new about metal detecting every week and it seems to me that this will go on until the day I breath my last. I will share however, some of the things I have learned that I think have netted me the most loot. This cannot be stressed enough. You have to slow down in order to allow the machine to process the signals AND also to allow YOU to process what the machine is telling you. When I hunted with the AT Pro, I hunted very slowly. I can hunt a bit faster with the Deus now but I still slow down relative to the speed of the machine and relative to my level of skill. I cannot tell you how many times I’ve caught a brief high tone among trash that I would have missed if I was hunting fast. This seems obvious and self-explanatory yet, many people I see out there keep their coil about one inch off the ground and sometimes even higher! Wow! Talk about cheating yourself! If at all possible, your coil should be touching the grass or dirt. That’s why we have coil covers. Every millimeter between your coil and the ground is a millimeter LESS of depth you are getting. Some day, the detector companies will figure out how to accurately identify a deep target and give you a nice consistent number on you Visual Display Identifier (VDI) screen. Until that day, you can rely on the VDI for the top six inches of dirt only. Everything deeper will give you a VDI, if you get a VDI at all, that won’t accurately reflect what’s under the ground. And even shallow stuff can give the wrong VDI number, depending on many different things such as trash nearby, amount of micro iron bits, ElectroMagnetic Interference (EMI), or the price of tea in China. Learn as much as you can from the audio signal. This means you will have to dig a lot of trash but believe me, it will pay off. I dig iron all the time. I don’t mean I dig the iron grunts. No, I mean, I dig the wrap-around iron signals that give a high tone. I am slowly mastering the difference in sounds between a really deep silver coin and a rusted square nail. This cannot be faked or short-cut. There is no trick. There is only technique that will be refined through many, many holes dug. And guess what, eventually, I plan to hunt iron grunts. It’s a well known fact that once a good target achieves a certain depth, your detector can only see it as iron. It is necessary to acquire more skill to identify a good target that has ‘gone to iron’. I hear people say that there is still plenty of silver in the first four inches of dirt. Really? Then why aren’t we finding many silvers every time we go out? Well, I happen to believe there is some silver in the first four inches of dirt but most of that easy, shallow silver has long been gone. No my friends, the silver that is left to us is either shallow but helplessly masked or deeper than six inches. Don’t fall prey to the “I don’t want to dig a 10 inch hole” attitude. Nowadays it’s easy to dig a 10 inch hole in a couple of seconds and it’s easy to do it neatly. And if someone tells you to use a probe as it was popular in the old days, please have them demonstrate how to use a probe on an 8-inch-deep coin and then please show ME how to do it so I will know. There are many variables that dictate how a target will appear to your detector and most of those variables change through time. Don’t be afraid to attack the same site multiple times in the year. And then, return to it year after year. Seems like a waste of time? I find silver coins in our city parks and those parks have been hit by thousands of hunters through the decades. Why did they miss the silver I am finding? Refer to the variables. And people in the future will find the silver I missed today. That’s just the way it is. As soon as you buy a metal detector, you begin to hear about Ground Balancing. Ground balancing is the thing you do to your metal detector so that it ignores the minerals that are ever-present in the soil and only generates a tone when there is a metal object under the coil. When you ground balance many of the detectors out there, especially the ones with some kind of digital screen, you get a number. I, like many others I am sure, thought that that number told me how bad the soil was (i.e. how much iron there was mixed in with the dirt). Turns out I was wrong. Imagine if you will, that your detector is a fruit detector. Now let’s say you want to find strawberries for your strawberry shortcakes. However, the strawberries are mixed with a bunch of lemons and melons (same letters in different order give you different fruit. Cool eh?). You want your detector to ignore the lemons and the melons and only beep when there are strawberries afoot. So you ground balance the machine to ignore the lemons and the melons. Simple. But what does the number mean? The number tells you what you are balancing out: lemons or melons. That’s it. 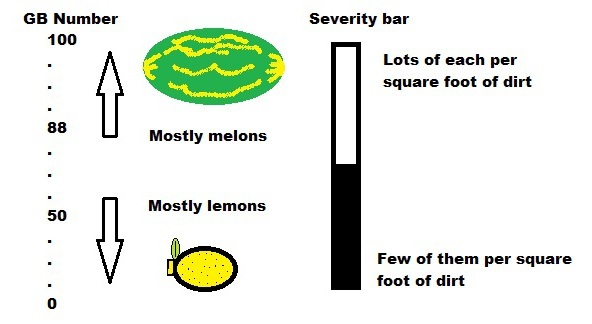 Now, you still don’t know how many lemons or how many melons there are in the ground. You, at this point, only know what fruit the machine is ignoring, not how much the concentration of either there is. To get back to dirt and metals, in our hobby we are concerned mainly with two minerals to ignore: iron and salt. Also, as with everything else in life, things are not so black and white. In reality, our soil is made up of a mixture of both. So the Ground Balance number is really a kind of an index. I suspect that this index is different for each brand and each model of detector out there. To my knowledge, no maker of detectors has ever put out a chart detailing what specifically each number means. The way I understand it today is that the higher the number the more iron you have and the lower the number the more salt you have.Now, many detectors out there have a little bar somewhere on the screen that tells you how much iron or salt there is in the ground. My XP Deus metal detector has a little bar. The White’s Spectra V3i had a whole slew of tools to tell you exactly what kind of mineral you had, what percentages of each iron and salt you had and how much of each. So to summarize; the ground balance number tells you what kind of minerals exist in the soil and the little bar (if you have one) tells you how much of each mineral you have. Don’t ask for more detail than this. The engineers who design metal detectors took Advanced Calculus and Differential Equations and they do all the hard work for us. I only got as far as College Algebra. I returned to the park where I found the Standing Liberty quarter yesterday after work. I was supposed to go my Karate class but there was no way I was going to be able to concentrate on anything else until I found and dug up the targets I found on Wednesday with my Deus metal detector. First, I have found ALL the coins and cool stuff in one particular area of this park; the West side of the park. Now, normally I hunt with the Iron Audio off. I hardly discriminate iron but on the Deus you can turn the iron audio off so even if the Deus finds iron, you don’t have to hear the grunt. Well with the new setup, I turned the iron audio on to full blast. This point becomes very important to the story in that with the iron audio on full, I was able to discover that the highest concentration of iron is on the West side of the park, particularly in the area immediately West of the play equipment. At this spot, in the past I have found, in addition to the countless square and cut nails, door hinges and other evidence of a structure that stood there in the remote history of the park. Why is this important? 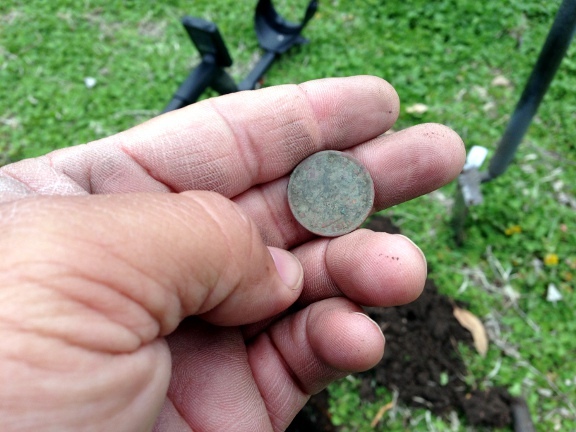 It is important because now it becomes clear as to why I have been finding coins that were obviously missed by the hundreds of hunters who have hunted this park since the 1960’s. Since this spot has the highest concentration of iron, it stands to reason that the highest concentration of masked coins also exits there. I even missed these coins with my other detectors. It is a testament to the Deus’ lighting fast recovery speed, arguably the fastest in the market today, that I am able to unmask all these cool coins, jewelry, and relics. This point was proven -to me anyway, when I moved to the other areas of the park and I found nothing. So the new setup has much usefulness but only in a situation where a heavy infestation of iron exists, which much to my delight, is also the situation I am likely to encounter at the oldest sites around here. For my other sites, hunting with the Deus setup for depth is still the way to go. I am now off my high and Stevouke doesn’t have to hear me go on and on like a 16 year old girl talking about her first date. Last, the new, unmasked signals I found at the park were mostly clad coins with a couple of brass objects mixed in (a thumb screw and a lipstick case). The new setup cuts my depth by about 2 inches, which I expected. 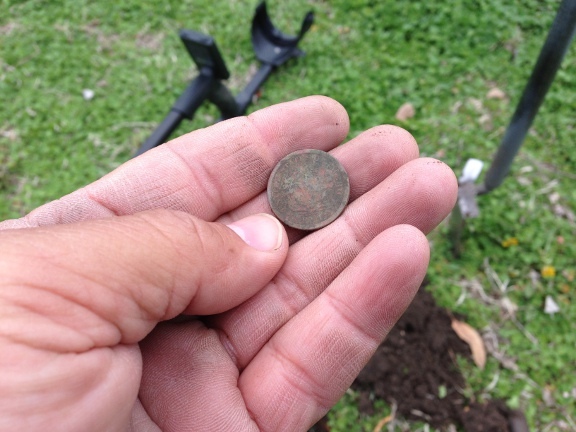 If I can unmask some old coins that no other machine can get, losing those two inches will be worth it. On my way to my Karate class on Tuesday, I stopped at the oldest park in Wichita for a few minutes of swinging my Deus metal detector. This park, aside from being the oldest park in Wichita, is also a one-block size park. The implications of this is that this park is one of the most hunted parks in the city and, because of its size, the likelihood that every square inch in it has been detected is high. HOWEVER, no place is ever really hunted out. I agree with Tom Dankowski when he says that most of the coins ever dropped are still in the ground due to depth and masking. I believe this is especially true in this park. I began hunting this park back in my Ace250 days with no finds. Zero. Nada. Zilch. 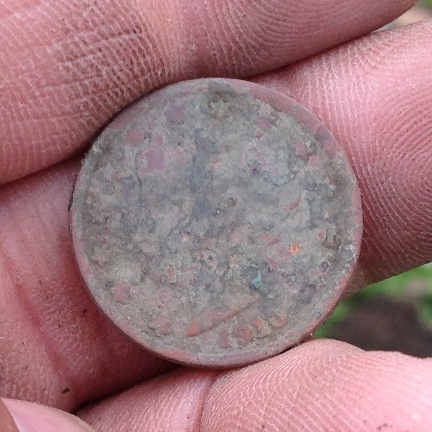 I found the first coin here with my V3i. It was a wheat; then, nothing. I returned with the Deus and the place began to pop. I’ve found numerous wheats, a Buffalo nickel, an Indian Head from the late 1800’s, a 3 ring bullet possibly from the Bleeding Kansas days, and a hulking gold chain. This tells me that the stuff is there. I love V nickels! This is my third one ever and the second this year. 1910. I wish it was in better shape but I’ll take it. Now, why am I going on and on about this park? For starters, I believe my Seated coin is here. The park is old enough. Then, this very small park is heavily infested with iron which means that many coins could be masked. Finally, I learned something new about the Deus yesterday that, if correct, could prove to be a game changer. I can’t wait to get back to the park to see if I am right! The snow storms are done and we are now facing dry weather for the foreseeable future. I hear here and there that we broke records. I did try to detect in the snow one day at the park. It was interesting to see that all the shallow pulltab signals had turned to iron signals since we had close to a foot of snow on the ground. I took that as a huge learning experience! Now I know for sure that the Deus will report deep signals as iron no matter what they really are. I suppose that this is the case with most detectors. The lesson of course, is to dig every deep signal. Now, the thing I finally came to learn with the Deus that I didn’t learn with the other machines I’ve owned is that even though the Deus reports the signal as iron, the tone is definitely not iron. I don’t remember if this was the case with the White’s V3i or the other detectors. So many deep, non-ferrous items will display this way on the Deus but it is not fail proof; I detected the oldest, most used part of one of the oldest parks in town and every deep iron signals with a high tone ended up being just that; rusty iron. Nonetheless, I think I have now decided to dig every deep iron signal that comes with a high tone. It feels like I haven’t detected in a long time. I am itching to go out there. On the other hand, all the school snow days (and my own snow days) gave me and my boys a chance to have a good time out there. We went sledding, had snow-ball fights, and even built a snow man. Good times. We named him George. 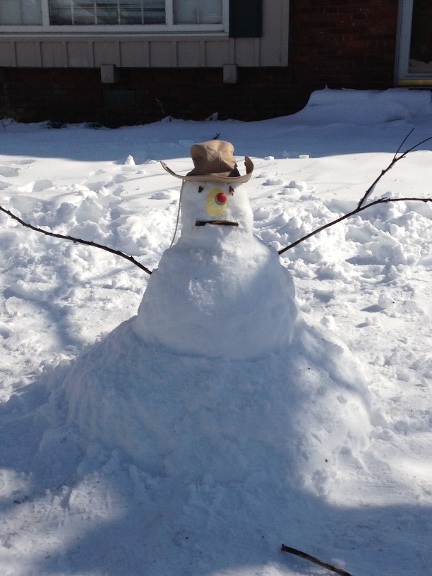 Not the most impressive snowman in the world but it was our first ever. This post is again, mostly directed at new and new-ish metal detectorists. Chances are that one of the first things you did after you decided Metal Detecting might be the hobby for you, was to hit the Internet. Upon doing so, I am willing to bet you ran across one of the many metal detecting forums out there. I remember when I ran into my first metal detecting forum. I chanced upon TreasureNet, arguably, the Big Daddy of them all. Man!, to say that I was star struck is an understatement! Some of the things those guys post there are just epic. And the stories! Oh! Some of the stories posted there made me go to bed with visions of untold treasure dancing in my head. I was so in love with the hobby and with the possibilities, that I entirely missed the warts. I then found several other metal detecting forums where I learned much of what I know today. Forums are a great way for information to collect and for information to be processed. They have an organic way to correct themselves via peer review. These forums are veritable metal detecting universities. Read them often however, and some things may begin to rub on you. My desire with this post, is that you will learn to take what’s useful from these forums and ignore the rest. There is a risk when reading posts in the forums, that you will throw the proverbial baby out with the proverbial bath water. For one, ALL the metal detecting forums are misnamed. They all should be named something like “Mostly about metal detecting forum”. Many personal opinions about many non-metal detecting related subjects are posted in these forums. I would be ok with this were not for the mean spirited posts. And I am not talking about flaming wars here, whereas a heated discussion about a particular facet of the hobby takes place. It seems all the forums have rules and regulations about inflammatory or degrading speech but often, posts of this nature are allowed to develop quite nicely before anyone jumps in and stops them. This is understandable since all forums are ran by volunteers and no one should expect volunteers to stay glued to their computers to correct things. Still, the behavior continues and it is a real possibility that at one point you may get tired of it and stop visiting the forums. This is unfortunate because, the forums are by far the most effective way to disseminate new information about our beloved hobby. Some forums have a section specifically designed for all non-metal detecting discussions but my experience has been that many people ignore these sections. I think that most people who post hateful attacks (and yes, political affiliation attacks are hateful as are racial attacks and gender based attacks) don’t see their behavior as wrong. If you are a police officer, a person of color, or if you live an alternative life style, you may be offended or angered by some posts. It seems to me that this happens in bursts, often after a particular person joins a forum and gets to make a lot of noise before leaving. Again, keep in mind that the majority of the people visiting these forums are decent, hard working folk who don’t post about their views because, well, because these are supposed to be forums about metal detecting. Most of the forums are heavily conservative. This reflects the demographics of the average metal detectorist. Now please, I am not in any way suggesting this is a bad thing, It is just the way it is. However, it can come as a shock to a non-conservative when they visit a metal detecting forum, expecting discussions about metal detecting, to find a number of posts that have nothing to do with metal detecting and the prevailing flavor of the conversations is conservative. Another thing about metal detecting forums you might as well accept is that they are male dominated and male centered. I’ve seen valiant efforts made by some forum administrators to make their forums more gender neutral or female friendly but they might just as well try to stop the tides of the oceans. All I’ve said so far becomes evident as you continue in this hobby. Although the forums are not perfect they are an invaluable resource that may require a bit of adjusting on your part. It will be worth it.